The ForceFlex® Multi-Task line of gloves provide the ultimate back of hand protection while providing full flexibility and range of motion. The HV200 full finger multitask style features an ergonomically designed Clarino® synthetic leather palm pad with Rough reinforced palm with EVA Padding. The injection molded TPR padding on the back of hand and fingers provides full dorsal metacarpal protection. The HV200 also features a 40 gram Thinsulate® liner with pocket in the cuff for a heat pack. The water and wind resistant bladder provides additional protection from the wet and cold. The orange mesh fabric backing and yellow palm provide excellent contrast. The neoprene slip-on cuff w/side flex panels and Reflexite® retro-reflective material on both sides of cuff provide a comfortable fit and high visibility for low light environments. 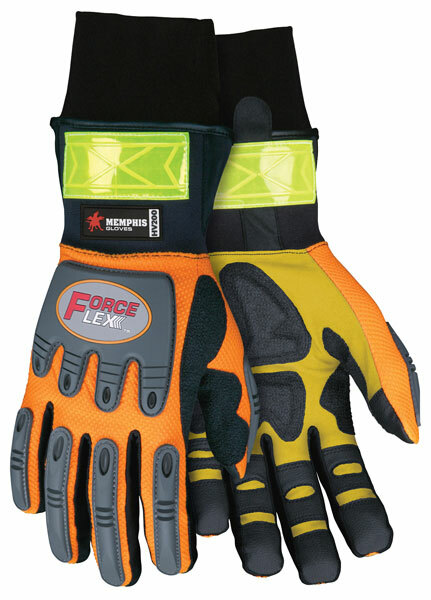 MCR Safety® Forceflex® Multi-task, D3O® back of hand and padded palm, Hi-Vis Aqua blue two-way spandex back, Tan suede synthetic leather palm base layer, Orange grid pattern reinforced grip palm, Slip on cuff, Pull Tab with ID panel for personalization.